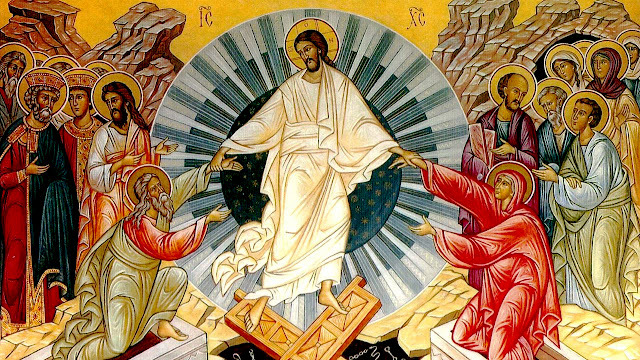 Eastern Orthodox Spirituality: What Has the Feast of Pascha Left in Our Souls? What Has the Feast of Pascha Left in Our Souls? And so, the Feast of Feasts has passed by us: and the Royal Gates in the Lord’s temples are shut; and the service is no longer as triumphant as it was during Bright Week. What, then, brethren, has this feast left in our souls? Christian holidays, you see, do not pass before us, one after another, just to leave our souls idle, but in order to discharge us from the cares and affairs of life’s concerns; to put it another way: the Lord provides us with holidays in order that we might temporarily put aside thinking about, concerning ourselves with, rejoicing at, grieving over, that which is worldly, earthly, quick to pass; but, instead, that we might meditate upon, concern ourselves with, rejoice at, that which is heavenly and eternal. It was precisely for this reason, as well, that the holiday just past was given us. The Lord made us worthy of beholding the all-radiant feast of Christ’s Resurrection in order that we might descry in it the first-fruits of the universal resurrection of all mankind in that last day of the world: Christ rose from the dead, being the first-fruits of those who had died (Cor. 15, 20), says the Word of God. It was for us, you see, that the Lord suffered, died, was buried, and arose: and His death, burial and resurrection is, as it were, our own death, burial and resurrection. It is for this reason that we sang during Mattins of Bright Week: yesterday was I interred with Thee, O Christ; conjointly with Thee do I rise today (Pasch. Can. Ode 3, Trop. 2). Yes, we all of us, invariably, shall rise up; and we all look for, i.e., await, the resurrection of the dead. This is as certain as it is certain that there will be a day tomorrow. Has this ever entered your heads; have you given any thought to this during the holiday? Yet it was necessary to think upon this, without fail. All the great holidays of the Church,—and the Feast of Pascha, in particular,—remind us of our redemption, through Jesus Christ, from the age to come. But such a one as believes in his resurrection from the dead, the same prepares here for the future life; attempts to live in accordance with the commandments of the Lord; honours the feasts of the Lord; and takes care not to offend against their sanctity through deeds of carnal impurity. And what was done among us, us Orthodox Christians, on this radiant Feast? It is shameful even to speak of it; but it is necessary to do so. Christians, to the great grief of Holy Mother the Church, turned the bright days of Pascha Week into dark days, days deserving of tears and lamentation. So very many celebrated not the feast of Christ’s Resurrection, and our own resurrection from dead works, but a feast of demonic resurrection in their souls. The Great Fast was a defeat of, was death for, the devil; because he fled from many souls and died to them, as it were, after their sincere repentance and communion of the Holy Mysteries; but on the feast of Pascha he rose again in not a few souls. How did he arise? Through gluttony, drunkenness, outrage and other vices that drunkenness gives rise to, and to which many Christians gave themselves over. It is thus that Christians love Christ; it is thus that they celebrate the greatest holiday of the year! What benefit is there in such people calling themselves Christians? Many pagans live better lives than that and, without a doubt, are more worthy in God’s eyes than are they. Those of other [non-Christian] faiths and those who are not Orthodox, who dwell in our city [Kronstadt] are astonished at such behaviour, and on so great a holiday, and say: there are the Christians, for you; there are the Orthodox, for you! They celebrate like real pagans, and on such a holiday, yet! That is what those of other faiths and those who are not Orthodox say of us. But what does the Lord Himself say of our holidays; or, more precisely—of our observance of them? My soul hateth your festivals, and I cannot bear the great day, saith the Lord, I am surfeited; I will no more pardon your sins (Esaias 1, 14). Brethren! Whom have we begun to resemble? to what extent have we given ourselves over to forgetfulness? And the word of Scripture is being fulfilled in us in all its force: and man, being in honour, understandeth not; he is compared to senseless cattle and hath become like unto them (Ps. 48; 13, 21). Christ the Lord hath honoured us with His name; He hath washed us with His blood; he hath made of us a chosen people, an holy nation ([I] Pet. 2, 9); while we insolently, madly, have despised God’s mercy and dishonour ourselves by all means of dissolute acts. Do not flatter yourselves, brethren: neither thieves, nor murderers, nor fornicators, nor adulterers shall inherit the Kingdom of God (I Cor. 6; 9, 10). Yes, if you do not cease from behaving thus, especially on holy days which, according to the Lord’s commandment, should be consecrated and sanctified, then ye will not see the Kingdom of God. Brethren! it is extremely necessary for us to behave more wisely, and to attend more closely to ourselves, during the feasts of the Lord. The Lord will call us strictly to account for our foolish revelry. It is not according to the flesh, as do those who worship idols; but, rather, according to the spirit, that we should celebrate our holidays; although even bodily celebration, if it occurs together with the spiritual, is permitted and is not hateful to the Lord; but, in that case, it must never exceed the bounds of moderation. God is spirit (John 4, 24; 2 Cor. 3, 17); our soul, redeemed by the Saviour, is spirit: therefore should our holidays be more spiritual than fleshly. Such a one as celebrates only bodily, the same celebrates not unto God, but unto his idol—the belly; or, which is all the same, to the demon of intemperance. God deliver everyone from such feasts! The abundance of material viands is permitted to Christians on holidays to the glory of God, in order that we might eat and drink in moderation, thanking God Who, together with spiritual joy, sends us bodily consolation, also, in the variety and sweetness of the viands and beverages, in order that our joy might not be wanting. But spiritual joy on a holiday must always surpass that of the body; while, with us—it is the opposite. It is said, in God’s commandment: remember the Sabbath day, and sanctify it (Ex. 20, 8); in our language of the New Testament, this means: remember the Day of Resurrection; do not forget its holiness and try to sanctify it yourself by your good deeds. O Lord! grant that we might always remember Thy commandment concerning how we are to celebrate holy days; that we might keep it holy and be well-pleasing unto Thee with spiritual celebration. Amen. Originally translated into English for "The Light Of Orthodoxy," Spring 1983, by G. Spruksts, from the Russian text appearing in Solntse Pravdy: O zhizni i uchenii Gospoda Nashego Iisusa Khrista ["The Sun Of Righteousness: Concerning the Life and Teaching Of Our Lord Jesus Christ"] by Protopriest Ioann (Sergiev) [of Kronstadt], Chapter 5, pp. 297 - 301. Reprinted by permission. English-language translation copyright 1983, 1998 by The St. Stefan Of Perm’ Guild, The Russian Cultural Heritage Society, and the Translator. All rights reserved.